Treadmill Silicone Oil Lubricant - 250 ml, extends your treadmills belt life. Treadmill Silicone Oil Lubricant - 100 ml, extends your treadmills belt life. 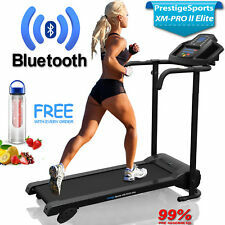 PRESTIGE SPORTS XM-PROII ELITE BLUETOOTH FOLDING TREADMILL - WITH ADJUSTABLE INCLINE, PULSE SENSORS & CALORIE COUNTER. Running with an incline has many added benefits. The advanced 3 level manual incline will help to improve body toning, burn more calories & reduce the impact on your joints. Hinweise:Das Gerät ist bis maximal 100 kg belastbar. Dieses Gerät ist zum Fitness- und Konditionstraining bestimmt. Es ist ausschließlich für eine Benutzung im Stehen geeignet. Mit dem Gerät darf jeweils nur eine Person trainieren. 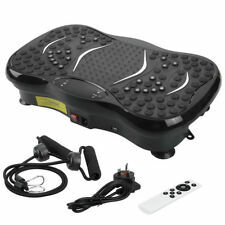 Get connected with this amazing Bluetooth treadmill, usually reserved for only the most expensive models. So whether trying to lose weight, tone up or simply stay in shape, this treadmill is ideal. App download required. Massima praticità e comfort! L'impugnatura è ergonomica e quindi si adatta a tutti i tipi di mano. E' realizzato con materiali leggeri e resistenti ed è la soluzione più sicura per accompagnarti nelle tue passeggiate o nella vita quotidiana. Feel the vibe! LCD-Display-Anzeige: Geschwindigkeit, Dauer, Modus. Fitness-Rezepte: mit dem gratisKlarstein "Fit & Healthy" Ebook. Fitness Pur: reduziert Cellulite und Körperfett, verbessert die Körperhaltung und stärkt unterschiedliche Muskelgruppen. Antriebssystem: Kettenantrieb. - Transportrollen: Vorne. Fahrrad-Heimtrainer - Ausdauertraining für Zuhause. Erleben Sie unsere Markenvielfalt Erfahrener Onlinehändler seit über 10 Jahren. Markenware aus dem Hause. Pédales antidérapantes avec anses réglables. Matériaux: acier, plastique dur. Résistance réglable sur8 niveaux. Poids: env. Notez que l'appareil est livré démonté. Moniteur de fréquence cardiaque. 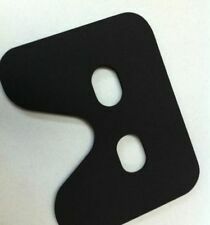 Sport Workout Hypoxic Mask Running Mask Fitness mask Achieve with 3 Level Air Flow Regulator. You can switch the resistance levels without take your fitness mask off so that you could get back to focusing on your workout. Vibration oscillante / pivotante, supérieure à la vibration verticale. Le massage par vibrations apaise les muscles raides et douloureux. 99 niveaux de vitesse de vibration. Amplitude de vibration 12mm abondante. Capacity: 100ml. AG Silicone Oil. 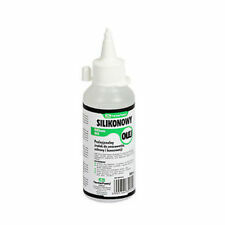 Chemical: Silicone Oil. Agent properties. Elliptical and Exercise Bike Tension Belt. 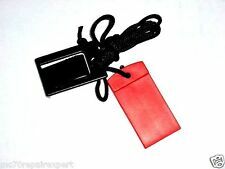 - Extra durable and long lasting with its double layer ofpolypropylene webbing and thick layer of protective felt. (can be made in any length or width required at request). Row, row, row your boat ! Certificat EN-957. Facile à transporter via roulettes. Différentes poignées. NEW PM5 MONITOR FOR CONCEPT2 ROWING MACHINE. Model #: EXIF09.0. Rated: 5-12 V, 1A max. IC: 8248A-G21ZEROG. FCCID: W70ZG2100-ZG2101. Breite 3D-Vibrationsplatte WBV-600.3D, 500 Watt, 20 Frequenzen usw. KondiMaster XTRA, Workout Timer with display and loud buzzer. Then the KondiMaster XTRA is the device of your choice. LED display (action/pause). beep every 20 seconds. RESET button. Further functions boxing /1 min. pause /4 min. boxing. etc. NEW PM5 MONITOR & SERVICE KIT FOR CONCEPT2 ROWING MACHINE. This board has been tested and verified to be fully functional. Neues AngebotSchwungmasse Heimtrainer HT 516 mit Notebook / Tablet Halter bis 14"
Concept 2 Monitor Pm3 , Suitable For model C D E Rowing Machines. Concept 2 PM3 Monitor , Suitable For model C D E Rowing Machines.. In excellent clean 100% working order Dispatched with Royal Mail Special Delivery (TM) 1:00 pm. And worldwide delivery available. Image 10.2 QL Very Good Condition Treadmill Rear Idler Roller 23 3/4" O.L.